Akita is the capital of Akita prefecture, one of the northernmost of the island of Honshu. It is the main city in an area famous for being very rural. In Japan, the prefecture of Akita is one of the main producers of rice, with a low population density, the oldest and constantly decreasing population in the country. Akita is also the prefecture with the highest consumption of sake per inhabitant. A very quiet city, rarely visited by tourists, except the first days of August when the Kanto Matsuri takes place. The area around Akita station is the liveliest shopping area in the city. By taking the west exit of the station, you will end up walking along a wide covered road with a number of department stores (depato) on either side. In the surrounding area you will find many shops and restaurants. To the south-west of Akita station there is an area with several some small pubs and izakaya. By taking the east exit of Akita station you will immediately find the long-distance bus station, and in front of it the ALVE complex: inside, among other things, a cinema (Lumiere), a theater, a manga kissa, a large space full of tables usually popular among high school students. If you keep walking to the east you can find several big shops, but the city center is on the west side of Akita station. This large park, the most important of the city of Akita, is located about ten minutes walk from Akita station, in the place where once stood the city's castle (Kubota Castle), definitely destroyed in the nineteenth century. 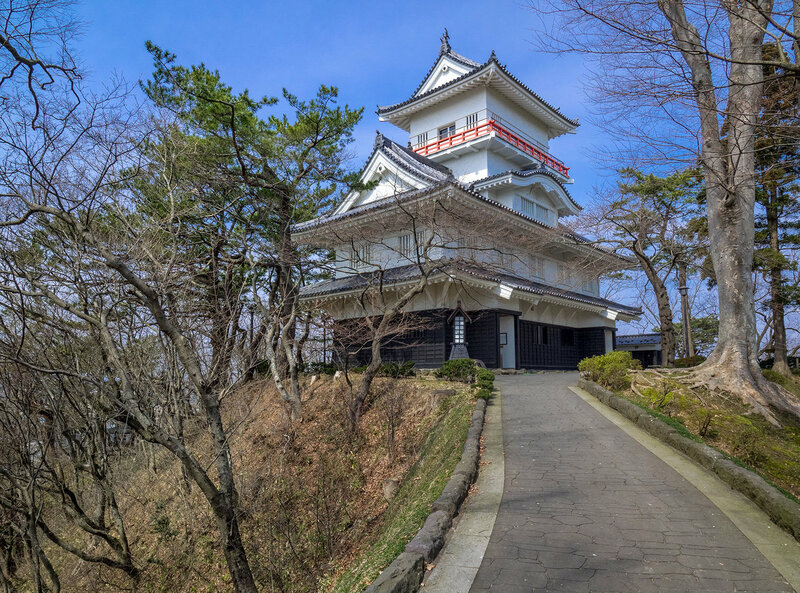 In 1989 a small tower was rebuilt, the Osumiyagura (admission 100 yen, 09:00-16:30), inside which you can find some expositions on the history of Akita and a 360 degree panoramic view from the terrace (if visibility is good you can also see the sea). In 2001 the main wooden entrance gate was also rebuilt, you can find it withing the park. Many cherry trees make this place very popular during the blooming season in spring (usually around the end of April), when it is full of pic-nics but also food stalls and shows. Inside there is also a small Shinto shrine that is very popular in the city during the New Year period. 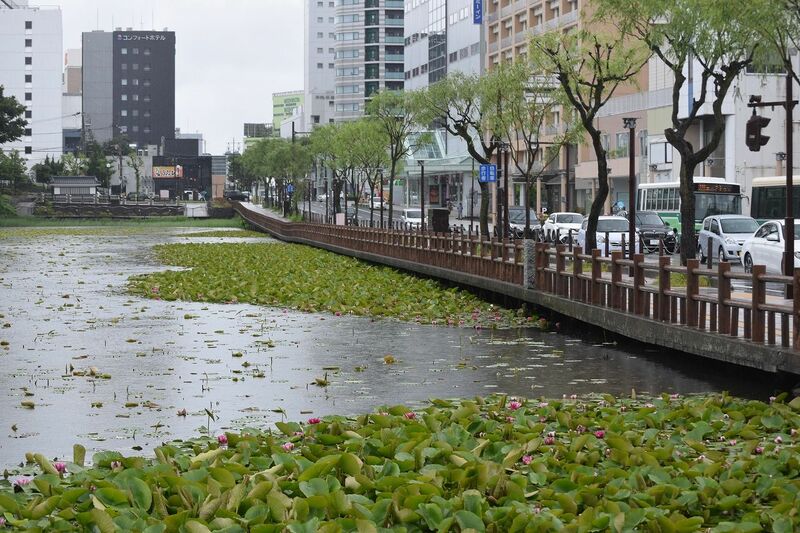 Next to the Senshu Park, and opposite the Akita Senshu Museum of Art, there is a pond with hundreds of lotus flowers. With the exception of the cherry blossom season, during the rest of the year this place is very quiet and peaceful, a perfect place for a relaxing walk. A museum of great importance, located 5 minutes walk from Akita station and opposite Senshu Park. 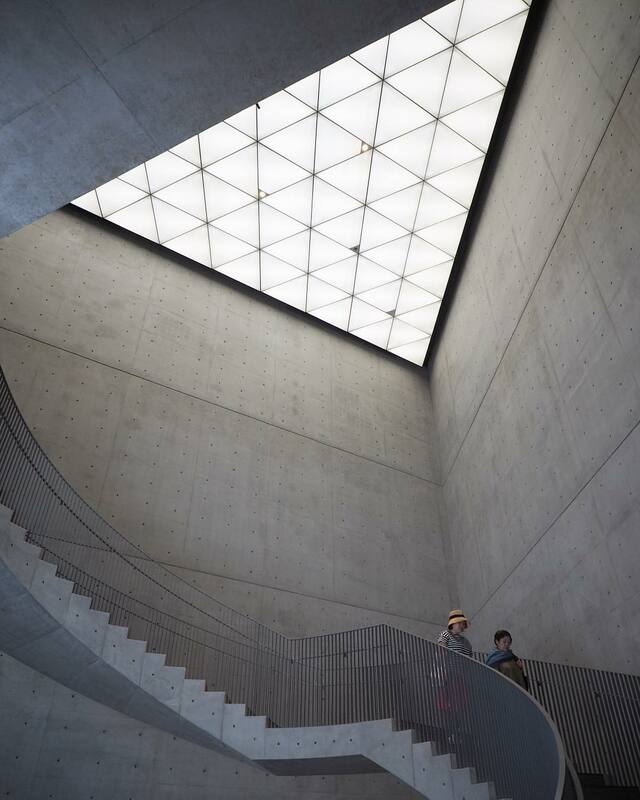 The museum is housed in a 3-storey building of great architectural merit, inaugurated in 1989 and designed by Tadao Ando. For example, the entrance is very interesting, a triangular space with a glazed roof and special stairs that amaze visitors. The museum collection includes above all Léonard Tsuguharu Foujita's paintings (1886-1968), a Japanese painter who spent most of his life around the world, especially in France, and eventually also obtained French nationality. He is considered to be the greatest Japanese painter of European-style works, and he was part of the pictorial movement of the so-called Paris School of the early twentieth century. In addition to the works of Foujita, there are also many other temporary and non-temporary exhibitions of local artists. A small museum dedicated to the traditional festival of the city, the Kanto Matsuri, a few steps from Senshu Park. Inside this museum you can get an idea of Kanto Matsuri. You can learn about the history, see some of the floats used, watch some videos. Also, helped by the museum staff, you can try to balance the bamboo rods used for the main festival exhibition (see below for Kanto Matsuri details). Kawabata is the nightlife area in the city of Akita. It is a 15 minute walk east of Akita station, on the banks of the Asahikawa River. In this area you will find a fair concentration of all the typical Japanese night clubs: pubs, restaurants, izakaya, karaoke, kyabakura and other red light establishments. In the small pubs of the area, if you speak a little Japanese, it is not difficult to chat with the bartender or with some customer sitting near you. The atmosphere is always very cheerful and the locals are quite friendly with foreigners, even more so after a few glasses of sake. A few minutes south of Kawabata you can find the love hotel area of the town (not so many though). 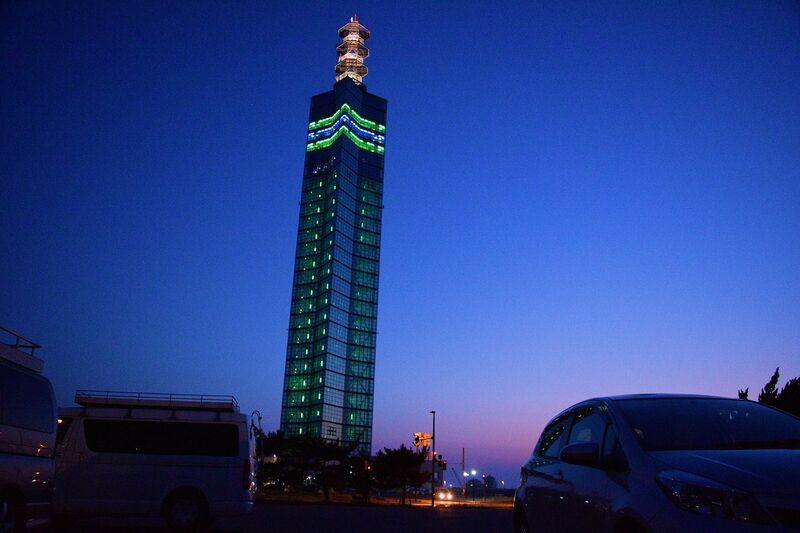 This tower is located in front of the sea, in the Akita port area, about 8 km from Akita station. It is the highest building in the city (143 meters) and its only modern panoramic observatory. The tower was inaugurated in 1994. You can climb up to the top floors (about 100 meters high) for free, through a glass elevator in the middle of the tower (opening hours 9-21). It is a 3-floors observatory, one of them houses a cafe (open until 17). There are coin-operated binoculars and some benches. The 360-degree view includes mainly the sea, the port and the surrounding industrial area, and in the distance the Chogai Mountain and the center of Akita. Unfortunately after sunset the night view cannot be enjoyed very well because the interior lights remain lit creating annoying reflections on the windows. Anyway, this place is almost never full of people, and depending on the day and time you could even be the only person there. It's a perfect place for romantic dates. Next to the Selion Tower there are two other buildings, the Selion Plaza (a convention center) and the Selion Rista, a glazed building inside which there is a garden with a playground for children and a very interesting automatic restaurant of soba and udon. To get to the Selion Tower from Akita station, you can take a city bus or the train up to Tsuchizaki Station and from there walk towards the sea for 15-20 minutes. The city zoo of Akita, not very big but still covers an area of 15 hectares and is home to more than 100 different species. There is also a small amusement park inside. It is a very popular place on weekends among families with children in the region. You will never have the feeling of overcrowding because it is above all a large and relaxing park, with lots of vegetation and a pond. Moreover, scattered here and there, you'll see cages and fences with the animals. You can get very close to some animals and even touch them or look closely when they're being fed. The zoo is located outside the city, about 8 km from Akita station. You can get there by direct bus from Akita station (ask at the tourist information center inside the station for details) or in 20 minutes walk from Araya station (8 minutes by train from Akita station along the Uetsu Main Line). AIU is a small university of business and international relations located in a rural area on the outskirts of Akita, between forests and rice fields. This is a university where all courses are taught in English and characterized by a strong degree of internationalization. Every year the campus is filled with hundreds of foreign professors and students from all over the world. There are a few ways to spend time around the AIU. First of all, it is one of the few places in the city where you can have a chat with some foreigner or young Japanese who speak English. One of the best places is the university cafeteria, open to anyone, where you can have a full meal with 40-500 yen. 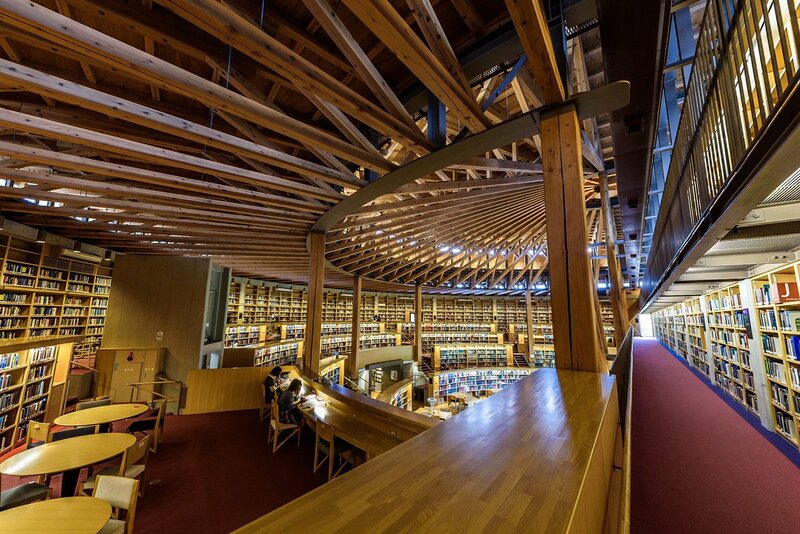 Inside the campus there is also one of the most beautiful libraries in the country, the Nakajima Library (see below). Just in front of the campus there is the Akita Prefectural Central Park, a huge park surrounded by forest and full of sports fields. The whole surrounding area is very rural and quiet, it is very interesting to go around enjoying nature, forests, small and semi-abandoned Shinto shrines, rice fields, farmers' houses. You could get off at Wada station (10 minutes from Akita station along the Ōu Main Line). At the Akita City Yuwa Cycling Terminal, located next to the university campus, you can rent a bike. Not far from this university there is also a large commercial area, Goshono. The university library, completed in 2008 and designed by the architect Mitsuru Senda. It is now considered one of the finest libraries in the country, and has won numerous national and international architectural awards, including the 2010 International Architecture Awards. The architect himself declared that he was inspired by the Colosseum in Rome for his design, and indeed the structure has been nicknamed "Book Coliseum" because of its amphitheater shape. The roof of the building is also stunning, looking like a giant wooden umbrella from the inside. The library contains some 80 thousand books, and being an international university more than half are Western books (mainly in English). The Nakajima Library is open 24 hours a day, 365 days a year for university students, 9:00 to 22:00 (9:00 to 18:00 on Saturdays and holidays) for everyone else. An area where there are several restaurants, large supermarkets and large shops, and in particular the largest shopping center in Akita, the AEON Mall. Inside the AEON Mall you will find several branches of popular Japanese and foreign chain stores and fast food restaurants. Just to name a few, Mc Donald's, KFC, Sukiya, Gindaco, Beard Papa, Uniqlo, MUJI, Daiso. Near the AEON Mall you can find a branch of Bikkuri Donki and Kappazushi, for electronics there is a big Yamada Denki. These chains are popular all over Japan, but not in Akita. It is not that easy to find big chains in this remote prefecture of Japan, and the branch in the AEON Mall is often the only one of the city. Inside there are also around twenty restaurants. 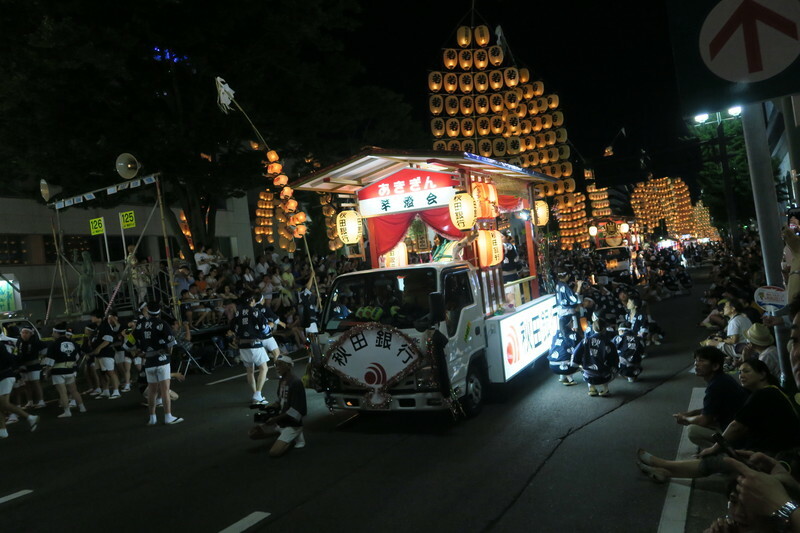 More information on Kanto Matsuri. 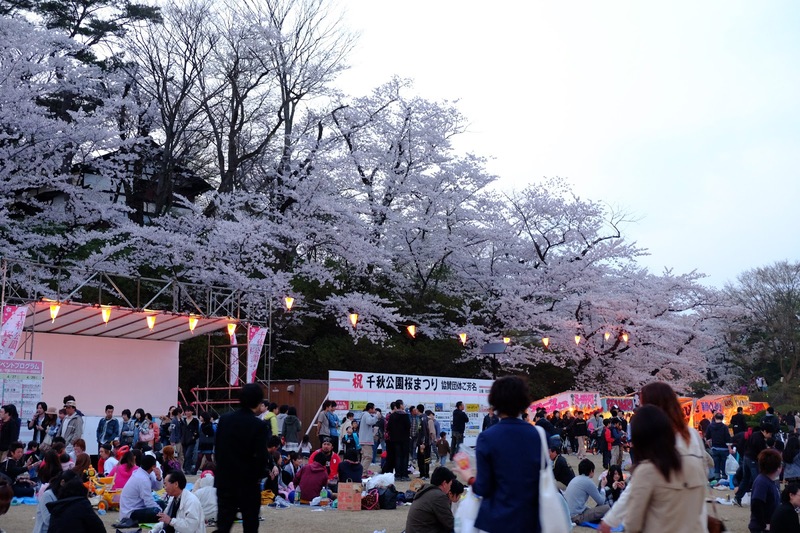 As you may have seen in some anime and manga, in all the Japanese middle and high schools and universities, students organize their annual festival. During this occasion the school is filled with food stands, concerts, shows and other events - all things are managed by the students - and anyone from outside is invited to go. 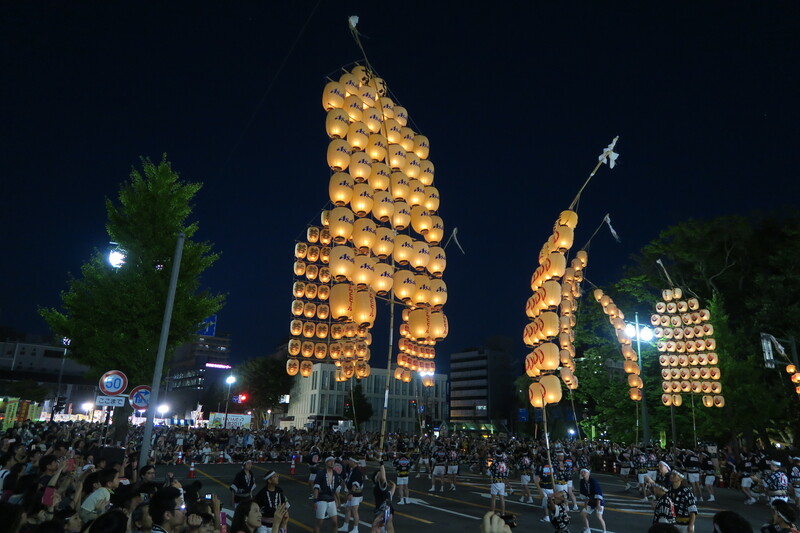 Akita International University also has its annual festival, usually in October. To know the exact date of the festival of the current year, just search on google "aiu festival" followed by the year (for example "aiu festival 2017"). It is a perfect opportunity to see a real Japanese school festival, in a context where most of the people around can speak English. Akita branch of the Dormy Inn chain, my favorite in Japan. This hotel is 5 minutes walk from Akita Station and just across the Senshu Park and next to the art museum, surrounded by various restaurants. The position couldn't be better. Rooms are equipped with all the comforts, average size. Beautiful public onsen on the top floor of the building. Free Ramen for everyone in the late evening! Located next to Akita Station, this is a very large hotel often used for weddings parties (fake church included!). Rooms are very spacious compared to the japanese average, comfortable and clean although a little 80's style, the same as the whole structure. Gym and sauna available to all guests. Inside there are several restaurants, in particular I recommend the buffet restaurant on the top floor for dinner, in front of a nice night view of the city for only 3000 yen. Great breakfast buffet. Staying in a ryokan is one of the most sensational and interesting experiences that can be done in Japan. 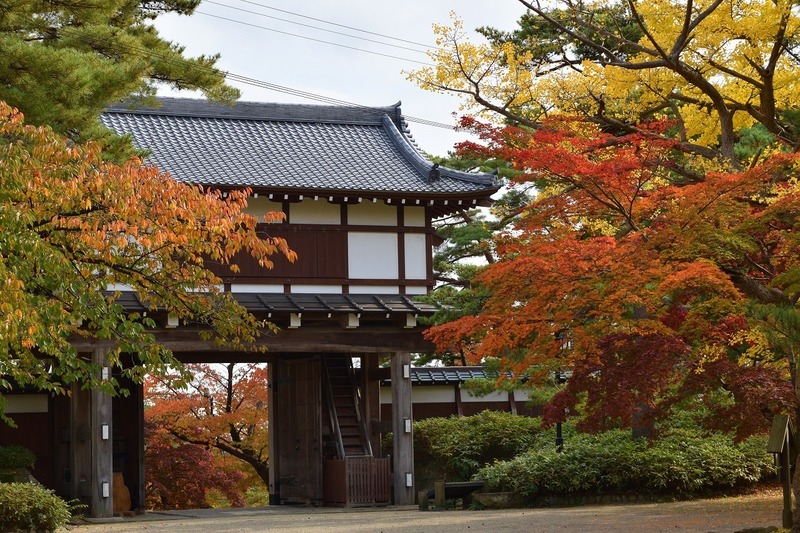 Ryokans are usually very expensive, but Akita is a rural region off the main tourist routes, so you can try this experience spending much less than in other more popular locations. Here Below two good ryokan in Akita, located next to each other. Located about 4 km north of Akita station, you can get there by bus or in a few minutes by taxi (about 2000 yen). All rooms have tatami mats and futons, some are very small, other ones are more spacious. All rooms have the toilet, some of them don't have a private shower or bathtub, since there are public baths. Onsen are very large and beautiful with several pools, including an open air pool (rotemburo) surrounded by greenery. Buffet breakfast is always included in the price and really fantastic. It's also possible to dine on site. Located about 4 km north of Akita station, you can get there by bus or in a few minutes by taxi (about 2000 yen). All rooms have tatami mats and futons, some are very small, other ones are more spacious. All rooms have the toilet, some of them don't have a private shower or bathtub, since there are public baths. Onsen are very large and beautiful with several pools, both indoor and outdoor (rotemburo). Breakfast is the traditional japanese breakfast. It's also possible to dine on site. 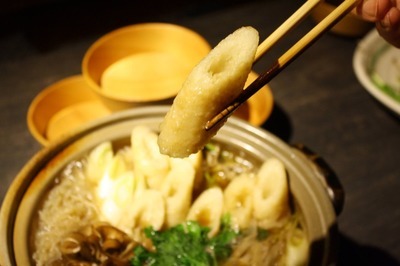 Kiritampo is the most famous local specialty of Akita. It is prepared by cooking rice and whisking it until it becomes a mash, rolling it forming cylinders and toasting everything on the stove. Kiritampo is usually eaten with skewers along with a sweet sauce, or immersed in a hot pot with meat and vegetables: it is the kiritanpo nabe, the most famous dish in the city. In the area of the west exit of Akita station you can find several restaurants serving kiritanpo nabe. Suehiro Ramen is a chain of ramen restaurants, not very big but still it can be found in different prefectures of Japan. The birthplace of Suehiro Ramen is Akita. Near Akita Station you can still find the first Suehiro Ramen restaurant, a little place with no more than 10 seats where to eat your ramen. The menu includes different types of ramen, but their most typical one is a shoyu ramen made with strong taste soy sauce and pork and chicken broth. A very interesting Italian restaurant is located in a side street just a few hundred meters from the west exit of Akita station. First of all Italian cuisine is excellent, especially pizzas, and for lunch you can order a set menu costing only 1000 yen which includes soup, salad, bread and a pasta dish of your choice. 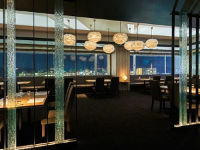 In addition, the atmosphere is very relaxing, with a decor of a real italian trattoria and a cheerful background music. Akita station is the terminus station of the Akita shinkansen, high-speed train line connecting Akita to different cities including Sendai (2 hours, 10370 ¥) and Tokyo (220 minutes, 17800 ¥). Local trains in this region are quite slow so it is not recommended to reach Akita with trains other than high-speed trains. 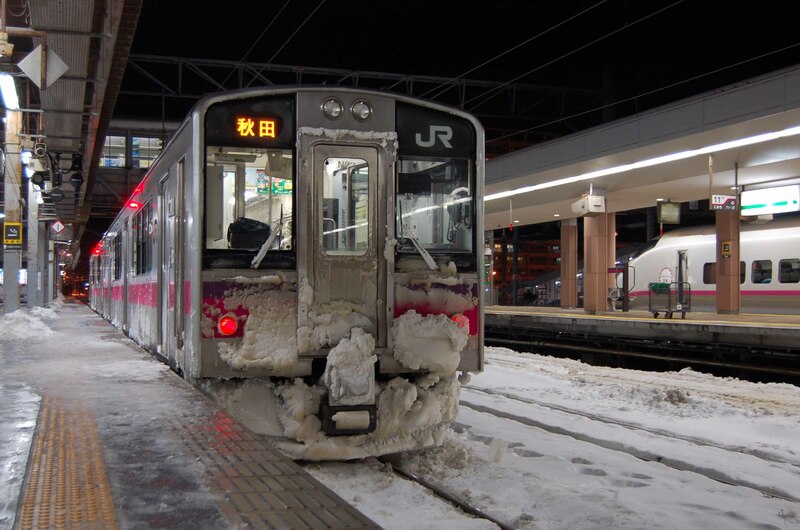 The only exception is if you are coming or you have to go to the cities of Aomori and Hirosaki to the north, easily reachable through the Ōu Main Line (160 minutes through the limited express service). Akita is connected by bus with Sendai (a bus practically every hour, tickets around 4000 yen, 3 and a half hours) and with Tokyo (night buses, about 10 hours, 5000-8000 yen). All buses leave from the circular square just outside the east exit of Akita station, near which you will also find a ticket office. For the connections to Tokyo, Willer Express also operates on the route. Akita has its own airport, Akita Airport (AXT), served by daily flights to Tokyo, Osaka, Nagoya and Sapporo. All flights are operated by Japan Airlines or ANA and prices tend to be quite high, on average at least 10,000 yen each way. Sometimes you can find very discounted tickets for 5,000 yen or so.